What makes Shea Butter So Desirable? Time to turn on the spotlight! Shea Butter (Butyrospermum Parkii or Vitellaria paradoxa), like the many edible nut “butters,” is derived from the nut of a tree. The African Shea tree grows primarily in West Africa. According to Vitamin Stuff, Shea butter is called “women’s gold” because so many West African women make their living from the production of this butter. Making Shea Butter is a laborious task. The nuts are cracked and the fleshy meat is taken out, roasted, and then ground into a paste that is then left to harden. What makes it so great in soaps is that it contains a high percentage of unsaponifiable oils. These beneficial oils are not destroyed in the soap making process and make the soap highly moisturizing. It gives the soap a “creamy” quality that most commercial soaps do not have or try to create with artificial (and sometimes dangerous) ingredients. Shea Butter melts at body temperature, and gives glide to solid lotions and body butter without becoming overly greasy. Shea Butter comes in several varieties. The ones used in bath and body products include raw, unrefined, and refined. I distinguish “raw” and “unrefined” Shea butter because I feel that they have different properties. The truly raw Shea Butter has a deeper yellow coloring to it. It can also have dark flicks in it from the roasting process. The roasting process produces a strong, nutty smell. It isn’t a bad smell, but if you’ve never smelled it before you’d be surprised. I usually find this type of Shea Butter in beauty supply stores, health food stores, or in African markets. Soap made with this kind of Shea butter is creamy and dense, but the color of the oil turns the soap brown. Any body butters or lotions tend to retain the strong roasted scent and can leave a greasy feeling on the skin. 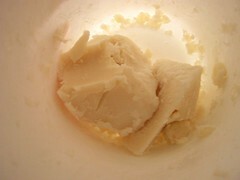 Unrefined Shea Butter is usually an ivory or off-white color and has less of a “nutty” scent. The scent does not usually come through in soaps. In lotions and butters, it may leave a faint nutty scent. It produces a lighter soap that is still very creamy. Unrefined Shea Butter is also firmer than either refined or raw Shea Butter and makes the soap long-lasting. Refined Shea Butter is white and creamy. It doesn’t have any scent because it has been deodorized and extracted using chemicals. It is the most common Shea Butter in bath and cosmetics. It products a light-colored bar of soap and very creamy body butters and lotions. Refined Shea butter maintains most of the vitamins in raw and unrefined, but does not make soap bars as hard. It is a good choice if you want the benefits of Shea Butter without the smell. Shea Butter is definitely a product worth spotlighting. Check out products that contain Shea Butter at my eBay store. what a great blog!! love this! !